I know, i'm obsessed by handwarmers..but i really love them! 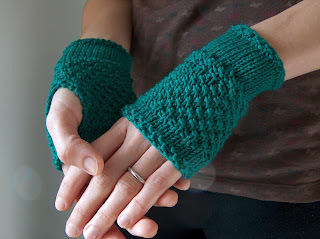 These are in a beautiful emerald green Merinos extrafine wool, soft and cozy. The pattern? A sudden inspiration, that i've obviously wrote down to share..every girl should have a pair of this! Work in Moss st for 3 Rows. Work in Stockinette st for 12 Rows (you should end up with a purl row). Start with Double Moss stitch, and repeat the pattern rows 6 times, ending with row4. Work 4 Rows in Stockinette st and then 3 more rows in Moss st.
Bind off loosely in Moss st using a 5.00mm needle. leaving 3,5cm open for thumb hole.